Boynton Beach was founded on September 26, 1898 when Byrd Spilman Dewey and her husband Fred S. Dewey filed the original plat in the Dade County courthouse for the Town of Boynton. The town was incorporated in 1920 as the Town of Boynton. The name “Boynton Beach” was first used by a community that broke off from the Town of Boynton in 1931. In 1939, that community changed its name to “Ocean Ridge” while The Town of Boynton took the name “Boynton Beach” in 1941. In 1926, the Seaboard Air Line Railway entered what was then simply Boynton, spurring land development a mile inland near the Seaboard station, including the town’s first planned subdivision, Lake Boynton Estates. As land became more valuable, areas along the Intracoastal Waterway and the Federal Highway in Boynton also saw housing developments. To the west, many dairies were founded so that the Boynton area became the main milk supplier for Palm Beach County. By the 1970s, the dairies were no longer profitable and these lands too were converted to housing developments. From the 1920s to today, Boynton Beach Oceanfront Park has been popular with residents and visitors alike. In the mid-1990s, the park underwent a major renovation during which the boardwalk was rebuilt out of recycled plastic. Boynton Beach’s Oceanfront Park was voted the best family beach in Palm Beach County by The Palm Beach Post in 2001. In 2011 the boardwalk was renovated again, replacing the plastic with Ipe (pronounced ee-pay) wood (commonly known as Brazilian Walnut). In 2012 improvements were made to the buildings along the boardwalk, including total refurbishment of the restrooms. In 2000, the city’s population was spread out with 19.9% under the age of 18, 6.4% from 18 to 24, 28.1% from 25 to 44, 19.8% from 45 to 64, and 25.8% who were 65 years of age or older. The median age was 42 years. For every 100 females there were 87.9 males. For every 100 females age 18 and over, there were 84.5 males. In 2000, native speakers of English accounted for 80.09% of all residents, while speakers of French Creole comprised 7.51%, Spanish was at 7.30%, French consisted of 1.02%, Italian at 0.97%, and Germanmade up 0.87% of the population. Jump up^ “2016 U.S. Gazetteer Files”. United States Census Bureau. Retrieved Jul 7, 2017. ^ Jump up to:a b “Population and Housing Unit Estimates”. Retrieved June 9,2017. Jump up^ “American FactFinder”. United States Census Bureau. Archived from the original on 2013-09-11. Retrieved 2008-01-31. Jump up^ “US Board on Geographic Names”. United States Geological Survey. 2007-10-25. Retrieved 2008-01-31. Jump up^ “Florida Estimates of Population 2017”. US Census Bureau. Archived from the original (XLS) on 2009-02-07. Retrieved 2007-08-15. Jump up^ Pedersen, Ginger L. (April 9, 2013). When Curiosity Changes your Life. 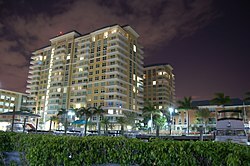 palmbeachpast.org. Retrieved September 28, 2013. Jump up^ “History of Ocean Ridge”. Archived from the original on 2012-03-21. Jump up^ Pesantes, Erika (June 14, 2007). “Angry neighborhood challenges City Hall”. South Florida Sun-Sentinel. Retrieved 2011-05-12. Jump up^ Pedersen, Ginger L. “The Last Cows of Boynton”. Palmbeachpast.org. Retrieved 2013-08-15. Jump up^ “Census of Population and Housing”. Census.gov. Retrieved June 4, 2016. Jump up^ “MLA Data Center Results for Boynton Beach, Florida”. Modern Language Association. Retrieved 2007-08-15. Jump up^ “Archived copy”. Archived from the original on 2015-07-04. Retrieved 2015-06-30.